What’s the best way to begin an article on learning? Why a pop quiz, of course! Which of the following facts about pregnancy and children are true? Answer: They are all true! And all were learned or shared as part of First 5 LA’s role as a learning organization, which helps to inform the work of First 5 LA, its partners, stakeholders, other funders, county agencies, parents, decision-makers and others working to improve the lives of young children and their families in L.A. County and beyond. 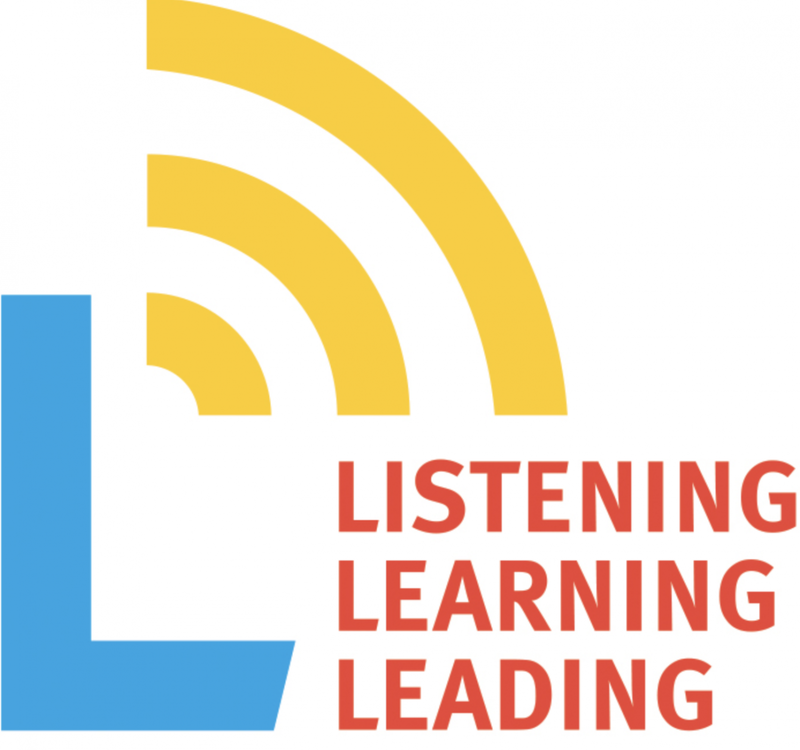 Since First 5 LA Executive Director Kim Belshé launched a “Listening, Learning and Leading” effort in 2013 that culminated in a new Strategic Plan focused on policy and systems change and a new organizational structure better aligned to the agency’s outcome areas, First 5 LA has continued to expand its knowledge collection and sharing endeavors. This includes funding research, sponsoring and attending conferences, participating on panels, hosting speakers and events, publishing newsletters and guides, engaging focus groups and briefing decision-makers. The statistics that 1 out of 3 infants in California born to mothers with a mental health disorder and 6 out of 10 infants diagnosed with prenatal substance exposure at birth were reported to Child Protective Services before age 1 come from studies involving researchers at the Children’s Data Network (CDN), a data and research collaborative focused on the linkage and analysis of administrative records to generate knowledge and advance evidence-rich policies that will improve the health, safety and well-being of our children. CDN has also created a number of informative snapshots of child well-being in L.A. County on issues ranging from childhood obesity to early childhood education. In an effort to inform the process of distributing Measure A and M funds using an equity lens, First 5 LA joined the Los Angeles Funders Collaborative on an equity report “Measures Matter: Ensuring Equitable Implementation of Los Angeles County Measure M & A.” Approved by L.A. County voters in 2016, Measure M is designed to build out transportation infrastructure and Measure A for parks and open space. Both are issues of importance under First 5 LA’s built environments focus in the Communities Department. Revealing the chronic gaps in the early care and education system parents of young children face within the county, The State of Early Care and Education: Los Angeles County Child Care Planning Commission 2017 Needs Assessment report was unveiled at a spring 2017 event featuring panelists, speakers and experts in early childhood education and policy and strategy. The report included the statistics that parents with two children may pay nearly half their wages for child care in Los Angeles County, even as licensed early care and education centers are only able to serve 1 in 7 working parents with infants and toddlers. The report prompted calls for significant state and federal investment and policy changes to address these gaps and generated a great deal of media interest and useful data for early care and education advocates. The report, which recommended a four-point plan for action in the county, caught the attention of homelessness experts at a national level. Just this month, Faed was invited to share the learnings from the report on a panel at the National Alliance to End Homelessness Annual Summit in downtown Los Angeles. “Understanding the connections of homelessness and trauma is an essential step in informing how these issues can be prevented and successfully addressed by the systems and staff that serve young children and their families,” coauthor Murphy said upon the report’s release. The issue of homelessness is not new to First 5 LA. First 5 LA has invested $35 million over five years in permanent supportive housing for homeless families with young children. On the topic of trauma, First 5 LA partnered with other funders in 2016 to launch a countywide trauma-informed care systems change initiative with the commitment of dozens of public, nonprofit and philanthropic partners. One result of this effort was a new report released last fall by the Center for Collective Wisdom (C4CW) entitled Trauma and Resiliency Informed Systems Change, which constructed a developmental framework to guide systems change efforts and recommended potential strategies for advancing this movement across the county. While First 5 LA works with its partners to determine implementation plans for these strategies, Faed said the report’s release has also generated calls from other organizations hoping to learn more and share knowledge about the topic. 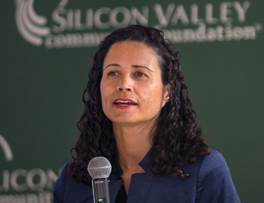 “We have received a number of calls from other organizations — including First 5 San Mateo County — to share our lessons learned and expertise on this as well as a number of invitations to national conversations on the topic of trauma-informed systems change,” said Faed, adding that the invitation came from The Robert Wood Johnson Foundation and the Center for Health Care Strategies. 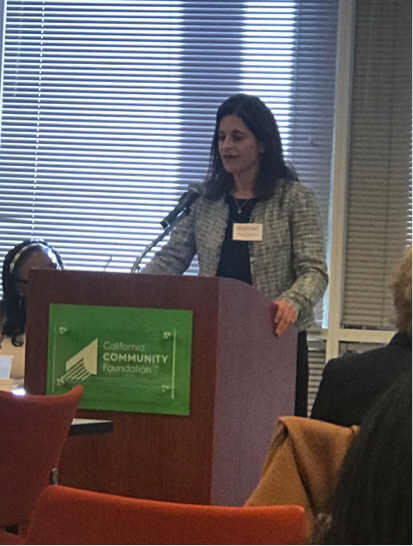 Vice President of Programs Christina Altmayer serving as keynote speaker at Maternal Mental Health NOW’s policy roundtable to launch their new briefing paper, Moving Forward: Collaborative Solutions for Perinatal Mental Health in Los Angeles County. The paper, which received input from First 5 LA, revealed that nearly one-third of new moms in L.A. County report symptoms of depression during pregnancy and nearly half after birth. Making a compelling argument for more investments in early care and education (ECE) and to pitch funding opportunities to pursue, First 5 LA's Vice President of Policy & Strategy Kim Pattillo Brownson presented and Senior Policy Strategist Becca Patton took questions at the Los Angeles Unified School District’s special committee meeting focusing on ECE. Communications Director Gabriel Sanchez presenting at the Storytelling for Healthcare Marketing & Communications conference in Boston this month on how audience research led to recommendations to better meet the needs of the populations we intend to serve in Welcome Baby, First 5 LA’s signature free, voluntary home visiting program. This research will also help inform our activities related to the L.A. County Board of Supervisor’s motion to expand and enhance home visiting in the county. From L.A. County to Sacramento to Washington, D.C., Public Policy and Government Affairs Director Peter Barth has extolled the societal benefits of investing in early childhood before numerous legislators and decision-makers, including a recent trip to the nation’s capital. No matter the panel or presentation, one message resounds throughout: collaboration is key to ensure that all children in L.A. County enter kindergarten ready to succeed in school and life. The Welcome Baby research presented by Sanchez was not the first time First 5 LA has learned by listening to the parents it serves or works with. Just last month, First 5 LA unveiled the Healthy Food Guidelines that were created with the insights and feedback from workgroups involving more than 30 community partners from the Best Start Community Partnerships. 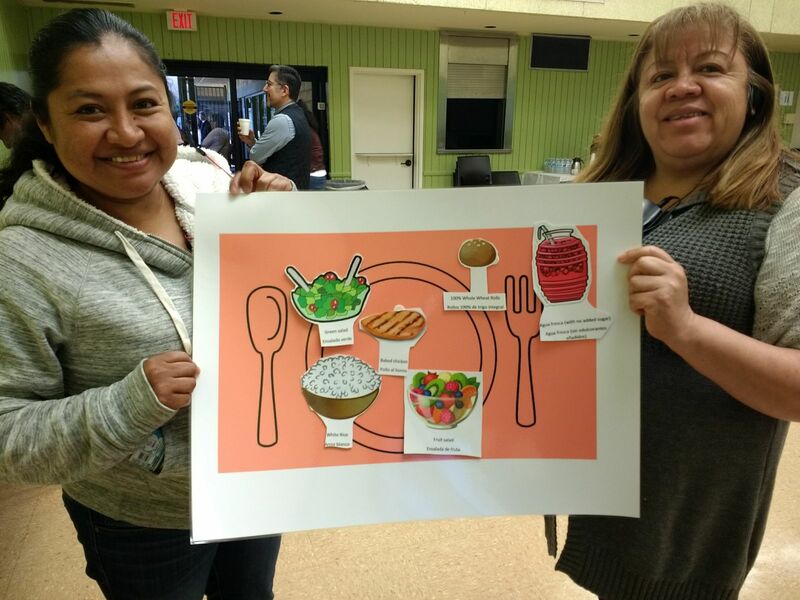 The guidelines, which will ensure that healthy food is served at the 50+ community meetings per month held by Best Start, are part of broader effort to improve healthy food access in the 14 Best Start communities throughout L.A. County. Fathers, too, provided essential input in a February focus group to learn from them if the Father’s Resource Guide produced by First 5 LA’s Communications Department was father-friendly and an effective resource. 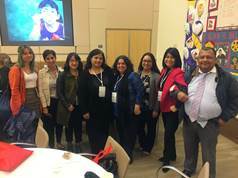 This inter-departmental collaboration, led by Family Supports Senior Program Officer Leticia Sanchez and Communications Marketing Strategies Manager Violet Gonzalez, proved educational. “There is no better learning than when you hear from the population that your marketing collateral is designed for,” said Gonzalez, who added that these learnings will be incorporated into the next Father’s Resource Guide, due out before Father’s Day. The fathers also shared an additional resources guide developed by Children’s Institute, Inc. (CII), which provides First 5 LA the opportunity to partner with CII in the future and possibly produce a joint Father’s Resource Guide in the upcoming year. Seeking out early childhood development experts to speak at First 5 LA presents a unique learning opportunity for staff, leaders and others working with or advocating for young children in L.A. County. 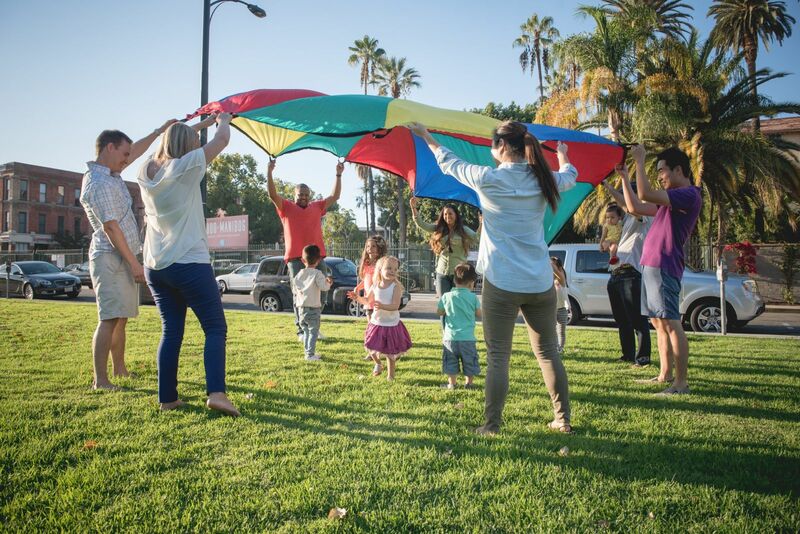 As part of its effort with other partners to launch Help Me Grow-LA in the county to identify children at risk of developmental delays and get connected with early intervention services, First 5 LA invited Help Me Grow founder Dr. Paul Dworkin last spring. During his visit, Dworkin discussed the importance of the HMG model, cited examples of success, answered questions and convened with the HMG-LA leadership council and workgroup members. 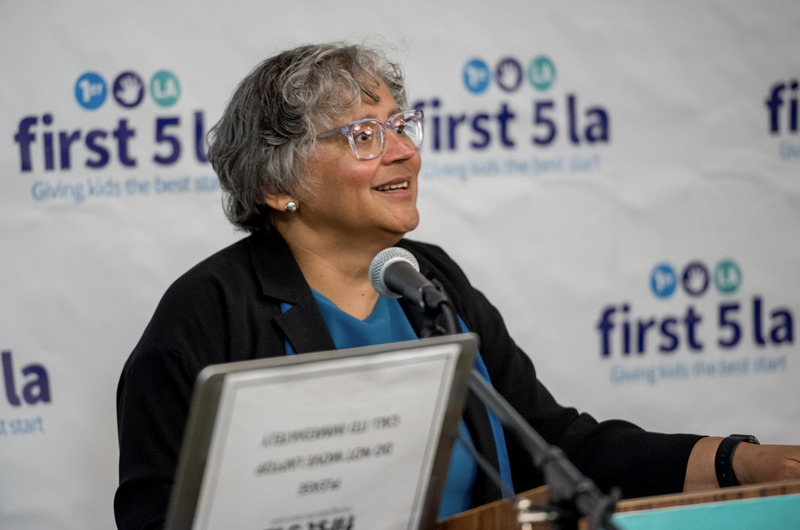 And earlier this month, Dr. Cecilia Conrad spoke to an audience at First 5 LA and guests about 100&Change, the MacArthur Foundation’s $100 million grant competition to fund a single proposal designed to make measurable progress toward addressing a critical need anywhere in the world. As penned in this article by Pineda, Conrad not only “opened a thought-provoking doorway to change for the children of L.A. County,” she also stumped for the use of a 100&Change Solutions Bank that emerged from the grant process: a website of grant application submissions that did not win but offered valuable solutions to world problems, including opportunities for organizations to find sources for collaboration and for philanthropists to seek out initiatives that align with their funding priorities. But perhaps Dr. Conrad’s most powerful revelation was that the four finalists had something in common that resonated with the audience of early childhood development professionals: each finalist proposed a solutions-based project focused on issues affecting children. “With the four finalists, I think it shows that that you can tell compelling stories about children and their needs and that resonates with people,” Dr. Conrad said. She added that the caliber of these finalists’ proposals prompted the MacArthur Foundation to provide each with a “nest egg” grant of $15 million. As noted above, both Dr. Conrad’s and Dr. Dworkin’s visits prompted articles on First 5 LA’s website and this Early Childhood Matters newsletter, just one of the many platforms where First 5 LA shares its learnings — and news on early childhood issues — with stakeholders, parents and the public. If you have not already done so, sign up for Morning Media for a daily round up of top early childhood news or, if your time is limited, sign up for The Week in Review for the week’s top stories. Stay on top of the latest parenting tips and get updates on free and low-cost family-friendly events with our Strong Families, Strong Kids monthly newsletter, by visiting First 5 LA’s parenting web page, or by checking out our quarterly Parenting Guide. With as many as 28 conferences and events sponsored in part by First 5 LA each fiscal year — and dozens of others attended annually by First 5 LA staff and leaders — First 5 LA is fully involved in spreading and attaining knowledge on early childhood matters in L.A. County and throughout the nation. First 5 LA-funded conferences and events — which promote professional development, parent education and community empowerment — included a wide range of issues important to First 5 LA: from fatherhood challenges to maternal depression; Parent Child Interaction Therapy to Autism; advancing systems change to helping immigrant children and their families cope with fear, separation and loss. 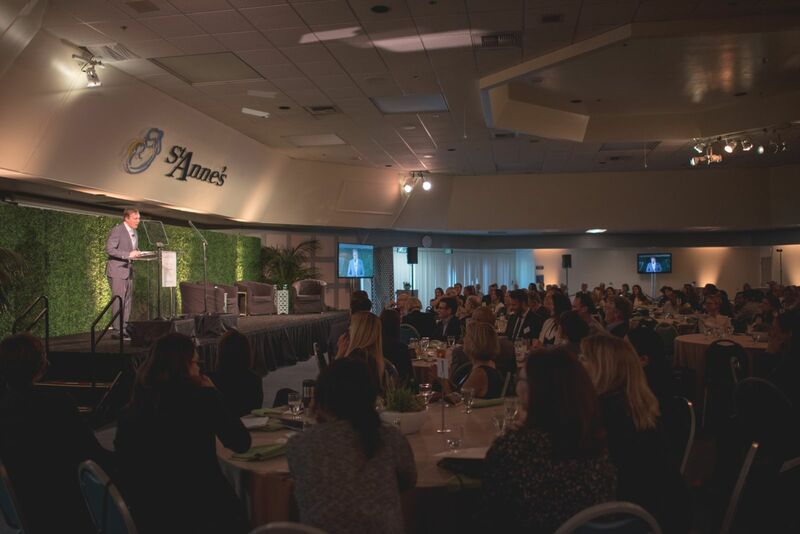 “Conference and event sponsorship funding elevates First 5 LA as an equal partner with other organizations that are hosting events or conferences disseminating best practices in early childhood development,” said First 5 LA Special Projects Manager Amelia Cobb, who manages the effort. Sandra Gutierrez, founder and director of Abriendo Puertas/Opening Doors, addressed the impact of First 5 LA’s sponsorship of the organization’s “Protecting Our Youngest” event last year featuring Dr. Joshua Sparrow, Director of the Brazelton Touchpoints Center and Boston Children's Hospital, Harvard Medical School. Those sentiments were echoed by Yesenia Mendoza-Menchaca, Partnerships for Families Program Manager with the L.A. County Department of Children and Family Services, which received First 5 LA sponsorship of its Advancing Best Prevention Practices 2017 — Prevention & Aftercare: Beyond the Basic conference. “Case navigators walked away with concrete strategies that they could use to engage better with families and better understand the impact of stress and trauma on the families that they work with, most especially those with children 0–5,” Mendoza-Menchaca said. Grants range from $1,500 up $10,000. Conference and event funding applications are accepted twice a year. Applications for the next round of funding, which funds conferences and events that take place between July and December, will be released during the month of April. Contact Cobb for more information at [email protected] or via phone at (213) 482-7822. On the flip side, First 5 LA staff, leadership and Commissioners have gained valuable knowledge applicable to their work by attending conferences and events that draw experts in their field throughout the year. Topics have included home visiting, childhood trauma, family violence prevention, fostering healing communities and applied organizational learning for business results. “The First 5 LA team and County partners were able to attend different workshops to bring back learnings to help inform and strengthen our work with families and communities,” First 5 LA Family Supports Senior Program Officer Diana Careaga said of her department’s trip to D.C. with Commissioner Linda Aragon to attend the Seventh National Summit on Quality in Home Visiting. First 5 LA Commissioner Marlene Zepeda said the sum of the learnings from these conferences and events add up to a benefit for all at First 5 LA, including the Board of Commissioners. If systems and policy change is the end result sought through much of the early childhood knowledge attained and shared by First 5 LA, one may wonder how best to put that knowledge to use. Pattillo Brownson shared one recent story from First 5 LA’s partnership with the Silicon Valley Community Foundation’s Choose Children 2018 campaign, which calls on California gubernatorial candidates to champion early childhood care and education (ECE) during the race. This involved sharing knowledge of ECE issues with the candidates before a series of moderated discussions with the candidates that occurred last fall.